I'm starting the project of a wooden sword, my very first one. I'm working with longsword dimensions, 40'' blade, 8'' on the hilt. Question is, with these dimensions, it's still suitable to use it one handed? And I must state, altough I love swords and stuff, I know little about technical terms and so on. I'm looking forward to learn with you guys! I'm sorry to have to rain on your parade, but this will not work. If you want a sword that is meant to use in one hand, it's not a longsword, it could be used in one, but if you really wanted to, even a Montante could. Hema practices longsword most often, so the single hand is not really an issue. There is a reason pine is not used in commercially available training weapons, nor was it a material of choice for hafted weapons, it's splintery, not strong, and too light to simulate a weapon. I would not like to spar with someone that handled a pine weapon, and would be hesistant to even drill techniques. If you want a cheap solution, bamboo would be better as it's much more flexible. A shinai could be made into a starter HEMA weapon, or hickory or ash dowels (handles of garden equipment), but the much more accurate synthetic wasters are not that expensive and would be made for the task. 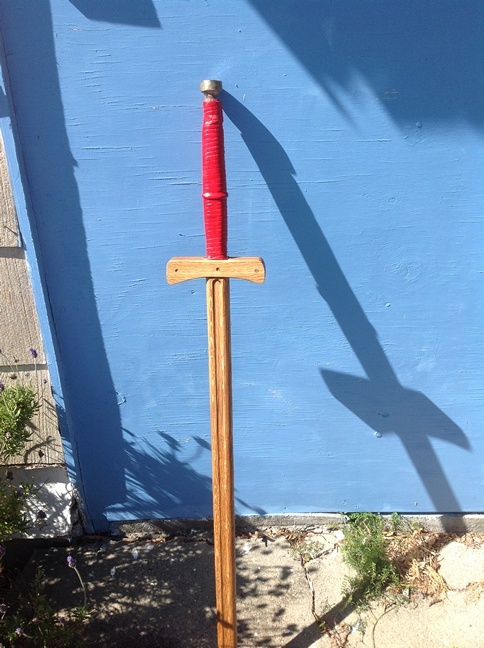 I've never made a longsword (though I've bought a some), but I made a couple wooden messers and I found that to be a fun project. I second most of what Bram said, however, I don't think pine would be a big issue if you are not planning to hit anything with it, and you don't make it very thin. It isn't ideal, but it should work. The dimensions seem fine and since pine is light, you won't have an issue using it in one hand. Although as far as I know in HEMA, it is almost always used in two hands. The amount of wood you need for a wooden sword is usually not terribly expensive, so you could look at that instead, or maybe go for some nicer wood once you have a chance to practice making the first one. If you do plan to spar, or even hit a pell or something, then I don't recommend pine. I have also made a sword scale model with pine wood, and it was pretty nice, but it was more a model to have a better representation of the real sword dimensions. I think it is a good project, as long as you don't use it to fence. And my opinion is the same that Bram: a longsword is made to be used with both hands. In some exceptional circumstances you must use it with one hand only (e.g. wrestling), but it is designed to be used with both hands. I'd echo what the other respondents said. If you plan to do ANY contact work, whether sword to sword or to pell, you will need a long grained hardwood. Pine is likely to splinter and break dangerously and you can easily hurt yourself or someone else. I tried a short grained hardwood (jarrah) - not a great success! A while ago i wrote down all the steps for making both a longsword waster and spadone waster. They are a bit large (pictures) but if you PM me an email address, happy to share. Posted: Mon 13 Mar, 2017 12:06 pm Post subject: So..
Hail guys! Thanks for all the advice! I didn't take any in the end, because I had no internet connection last week. I've made the sword, but piece by piece, and now it costed me functionality. It is a useless prop. I should've made it whole from a single chunk of wood, but, live and learn. I'll do another when I buy proper tools, I've used very primitive and simple tools to do it. As for the functionality, I will try to fix the pieces with some glue and resin, see if it works better than screws, but I'm not hoping to anchieve anything. I didn't use pine after all, I used a local wood named "cedrinho", I couldn't find the english name... It's a pretty though wood, that I can tell, working with it was extremely hard. I think I'll use it for other swords, when I buy electric tools. Anyway, thanks! I'll continue posting here for advice and even showing my works to you! This does look like it could start you on the journey. Near the tip, a longsword can be as thin as 3mm, and since it's diamond shaped, it's only half the volume. A 1.5cm rectangular plank the width of the sword near the tip would be exactly as heavy. Near the base, the sword could be 6mm or even more, wood 3cm thick of the same width as the sword would be needed. That's not easy to get into planks, so you could use a plank that's of even width, say 2cm, and have it taper a bit more. Say we have a sword that is 3cm near the tip, and 4.5cm near the base, and we'd want to emulate this in wood. Our plank of 2cm thickness would need to be 4.5cm2/2cm = 2.25 cm wide. At the base we make the same calculation 4.5cm*0.6cm*5=13.5 cm2, our plank of 2cm thickness would need to be 6.75 cm wide. Round off all edges of the wood, which costs a bit of materal, but you can then practice with it a lot safer. I'd use a 1:3 or 1:3.5 grip+pommel to blade dimension, so a 40" total length would have a 10" grip+pommel. I'd also use a pommel that does not have a larger circle than 5.5 cm. It is stated that the guard should be handle length, but there is a lot of variance. Can't hurt to keep it at that though. The guard can be easily made of the same plank, a slot made into it, and fitted in place with glue and a few screws. You'll find it is hard to balance the sword all in wood, drilling a hole into the pommel and filling that with lead does help. If you're making a 40" longsword, it's easy to make two of them from a 45-50"*4" plank. Whoa, thanks for the technical information, I will use it in future projects! I have made ~40 longsword wasters on the following dimensions 1200mm long, 45mm wide 25-28 mm thick in oak, we have yet to have a breakage and they are used weekly. The grip is 300mm, blade 900mm. The thickness is 25-28mm thick at the cross and tapers to 15mm at tip. I've put fullers into some and made flattened diamond sections for the others. I've poured lead pommels and these are screw threaded into the grip, most of the waster balance a hand's width from the cross. 1. They need to have a straight grain running the length of the waster. 3. The taper makes them perform more like a sword as does the pommel.